The S&P 500 is currently testing major support near 2420. A drop below 2400 would definitely not look good, but as long as that doesn’t happen we better the possibility of another rally here. All my indicators are in the bottom zone but not turning up yet. If the S&P can hold above 2400 for a few more days then the Earl is likely to turn up first, with MoM following suit. But that remains to be seen, of course. We are in a lunar green period and our LT wave goes strongly positive this week. That “should” give us at least some rebound rally and if that rally is very weak then it would be a very bearish sign. The solar eclipse over the US will gather some attention today, even on Wall Street. I wrote about this eclipse a few months ago, so you may want to check out that article. See also my older article: Eclipses and the Stock Market. Basically, the historic tendency has been for stocks to drop in the lunar red period that comes two weeks before a solar eclipse. The Nasdaq dropped 206 points in the lunar red period that ended on August 11, again confirming that idea. And then the market tends to climb in the green period containing the eclipse itself. We will find out this week if that happens again. That wouldn’t rule out a further correction or even bear market in September or October, but I wouldn’t worry too much as long as the 2400 level holds in the S&P 500. The same drawing I posted on July 11, with the S&P now moving nicely into the projected blue target circle. That’s not the product of some magical crystal ball I have, but merely linear interpolation of the recent trends. That obvious trend will stop eventually and the big question is when and where. My Earl indicator has turned down already, and the slower Earl2 has all but negated the recent rally. That’s what I warned for and this is a reason to be very cautious at this point. It looks weak but as long as no trend lines are broken things are holding up. How much longer? I don’t know. All we can do is watch and be ready. For August the wave suggests weakness until around the 15th, followed by an unusually strong period until the 25th. 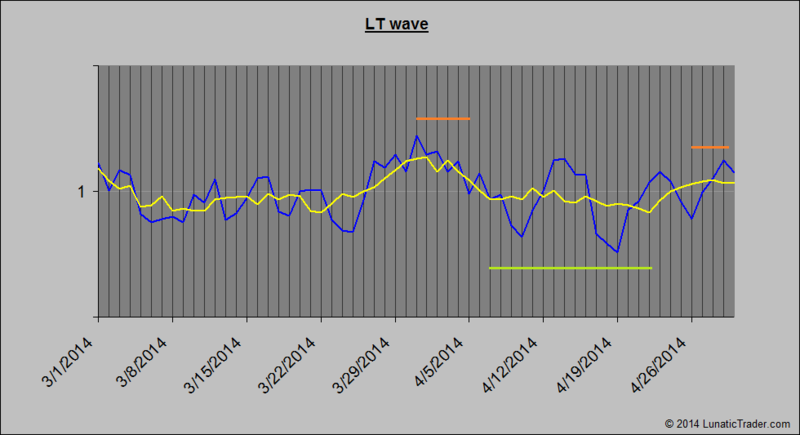 The lowest LT wave value comes on the 10th and then goes to a very high LT wave reading on the 23rd. 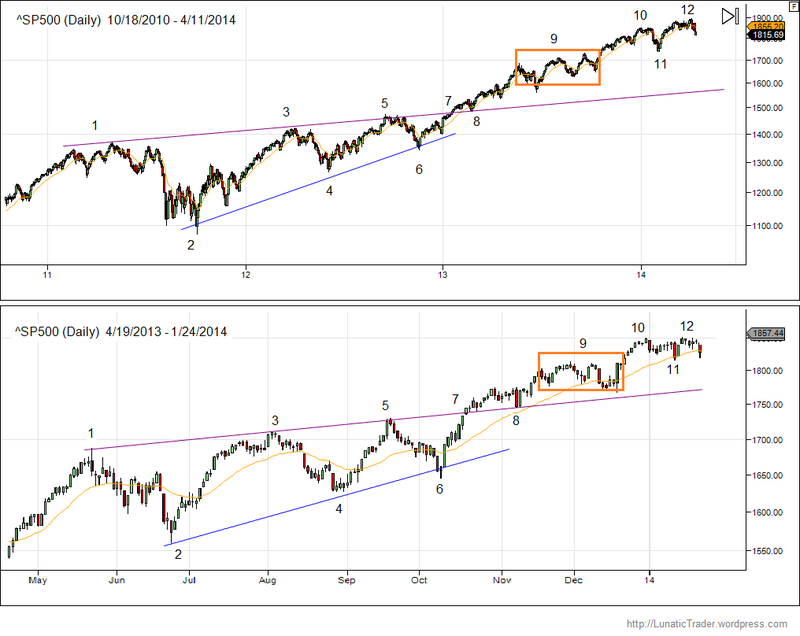 If the S&P gets through the weak period without technical damage then a major high may be seen on 23rd (+/- 1 day). 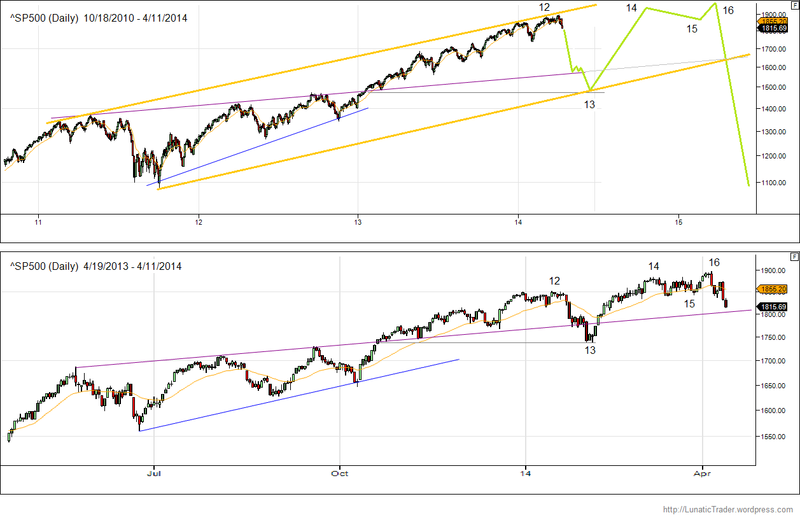 If we get a significant drop first then 23rd is more likely to become a rebound high in an ongoing decline. That are the two major scenarios I would consider at this point. As always, please remember the LT wave is experimental and will not always work perfectly. I also want to revisit my June post: Get ready for the August eclipse. As expected, news media and astrologers are getting very excited about this event, e.g. this Newsweek article: http://www.newsweek.com/total-solar-eclipse-trump-astrology-prediction-643776. Basically, if anything serious happens to the US or its president in the next two years then astrologers will conveniently blame it on this eclipse and take it as proof that their methods work. Question: and when was the last time nothing significant happened over a two year period? History doesn’t repeat, but sometimes it rhymes. As far as direct year to year comparisons go this is as good a rhyme as you will ever see. The rates of change differ, but the important highs and lows keep matching well. At some point the rhyming will stop, but we don’t know when. An S&P surge above 2500 in August, with breakout above the blue line, would make the historic comparison even more compelling. A similar October crash, taking into account the differing rates of change, would then target 2150 (= the 2015 highs). I never have more than 60% confidence in any scenario, including this one. But I am keeping an eye on it. 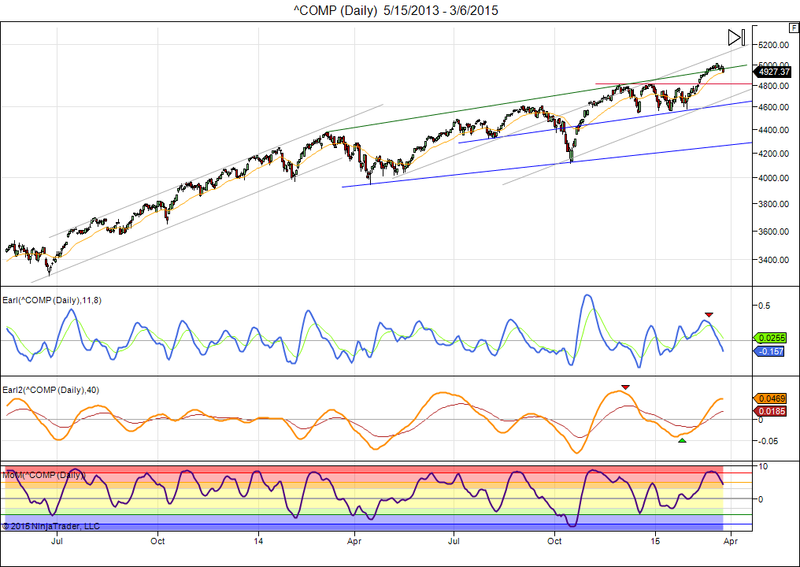 The Nasdaq has gone mostly sideways in recent weeks with a few spikes reaching for 5000. This could be setting us up for a further climb towards 5200 in the coming weeks. Technically the Earl indicator (blue line) is now in bottom territory getting ready to turn back up, while the slower Earl2 (orange line) is still climbing but starting to flatten out a bit. This allows for another push higher in the upcoming green period. A failure to get another rally going would not bode well and signal that we are starting a broader market correction. A drop to 4800 support level would still be OK, but any deeper drop would spell bigger trouble. We just watch and respond. The bull market scenario remains intact until it doesn’t. The most common mistake in investing is to call for a top too early, as countless analysts have experienced once again in the recent years. As I mentioned in the introduction, we are heading into an eclipse green period. For readers who are new to this blog, check out my more extensive article about Eclipses and the Stock Market. Basically the lunar green periods that contain a solar eclipse have a history of being very positive for stocks. That’s why a surge to new records is definitely possible. But it is not guaranteed. The upcoming solar eclipse of March 20th will fall within a day of the spring equinox, and that is very rare. The last time a solar eclipse fell more closely to a spring equinox was in the year 1681. I did a little study on equinox eclipses (considering both the spring and autumn equinox) and here is what I found. 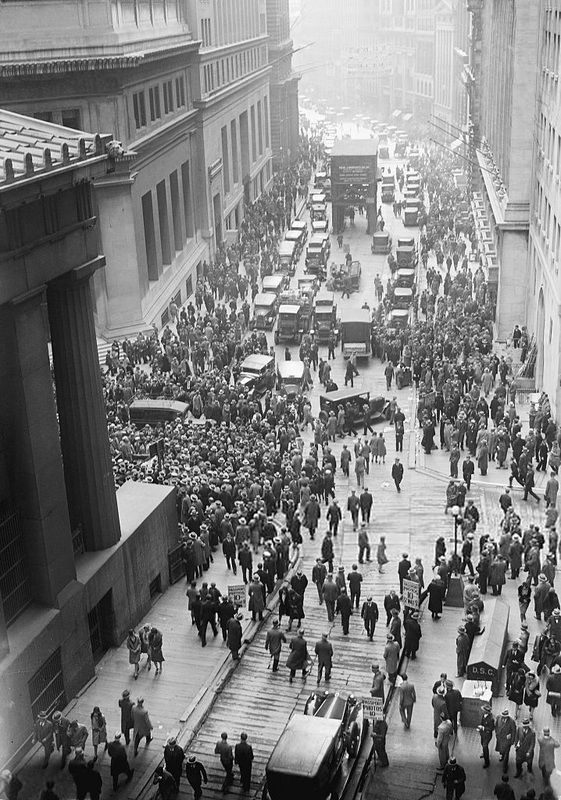 It marked the end of a 20 year bull market, and the S&P declined 35% in the next few years. Market kept going sideways for more than 10 years until the great bull market of the 1980s got underway. That were the only two equinox eclipses in the 20th century. Once again the market has been climbing for years. Will the equinox eclipse of March 2015 mark another major top? Time will tell, but the technical setup is now very similar to the one we had in 2007. 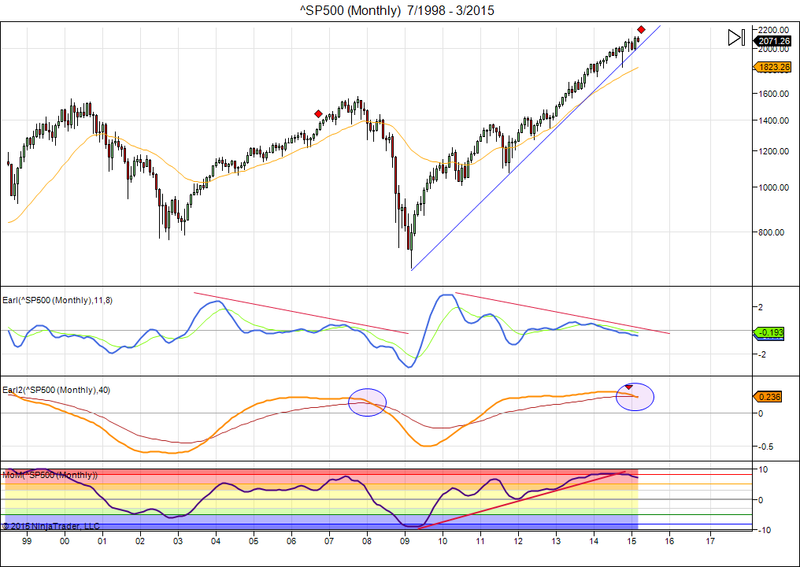 We see a bearish divergence in the Earl (blue line) and the slower Earl2 (orange line) has just turned down. Once the up trend line that started in 2009 gets broken to the downside we are quite likely to see a serious drop. As if that is not enough, later in 2015 we will also get the visit of Solar Saros 125, which has a history of producing financial panics going all the way back to the tulip mania in 1637. See my article: The Saros cycle and the stock market. Warning: with only a few observed cases we better remember that the law of small numbers applies. So, these bear markets that came on the heels of equinox eclipses can be the result of coincidence. I don’t give any guarantee that it will “work” again. Don’t bet the bank on it. It is just a hypothesis I am passing on. Equinox eclipses tend to come in clusters (for reasons that exceed the scope of this article). We have seven more coming up in the 21st century: 2025, 2033, 2034, 2052, 2053, 2071, 2072. So, there will be more chances to see if this tendency keeps up. Stocks will crash, buy gold? 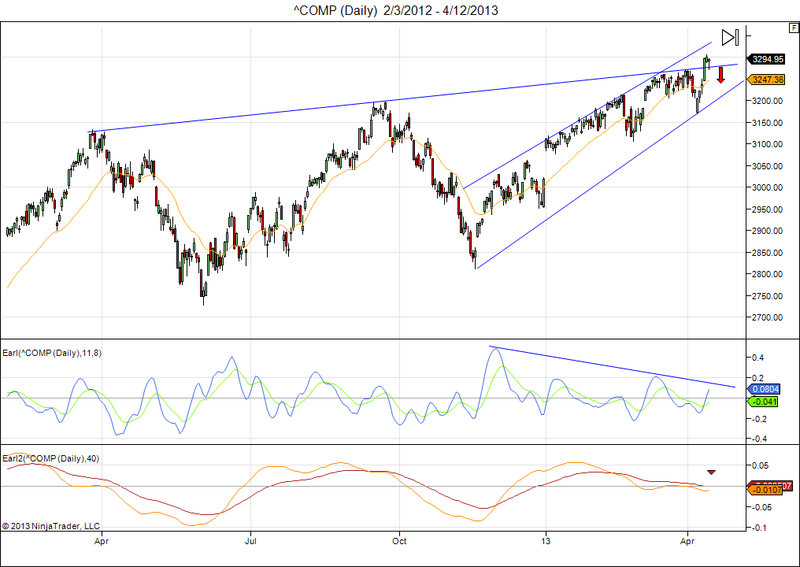 Bearish divergences are now even more clearly visible in all my indicators. The 1800 level is very important for the S&P. If that level doesn’t hold then a drop to the 1600-1700 area can come really quick. So we better be careful. Yes, a crash is possible when such a long term trend line gives way. As we have pointed out before, eclipse red periods have a history of producing sharp downturns and this time is no exception. We remain in lunar red period until the end of this week and I expect some bottom to form soon. The ensuing eclipse green period usually brings a strong rebound, so be ready to do some speculative buying on down days. If the S&P holds the 1800 level this week then it can even surge back to 1900 by May. We will study that scenario next week, before the green period gets underway. * October 1987 crash, gold price: $455 -> 3 months later: $480, 6 months later: $445, 1 year later: $396. * Mar-May 2000 (Tech crash), gold price: $293 -> 3 months later: $272, 6 months later: $277, 1 year later: $266. * Aug-Nov 2008 (Nasdaq drops 50%), gold price: $912 -> 3 month later: $730, 6 months later: $918, 1 year later: $960. Buying gold as protection for a stock market crash doesn’t look like a good idea. The reason is not hard to guess: a stock market crash has deflationary effects and causes some investors to liquidate other assets (like gold) to avoid bankruptcy or margin calls. The better strategy is to buy gold 3 months to 1 year after the start of a stock market crash. From the topping area(12) we got a quick drop that found initial support on the old trend line and then dipped even lower to bottom out at the level where it broke away from the old rising wedge(13). And then a surge to new all time highs with another broad topping formation (14-16). Will this pattern repeat? I don’t know. Bear in mind that this kind of market fractals cannot work forever, so it is more a question when and where will the market break away from this pattern and especially: how? But as long as it is in play it is a scenario worth watching. Right now it suggests a summer 2014 low around 1500 and a final market top in 2015 with the S&P 500 climbing above 2000…. and then a real crash. Well, why not? The Nasdaq has dropped to an interesting support level as it is testing the bottom of a long trend channel that started in late 2012. 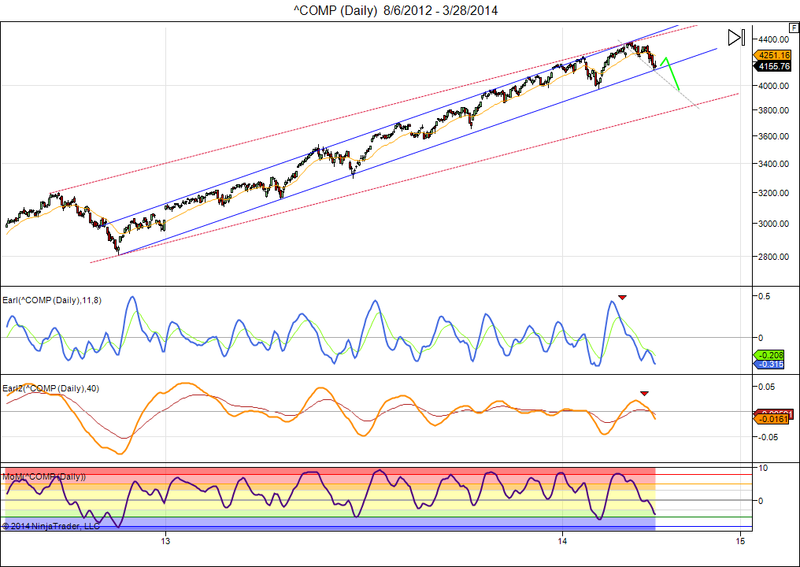 We could see a dead cat bounce in the next couple of days, but I think the upcoming eclipse red period will see the Nasdaq drop out of this channel. That would push the Earl2 and MoM indicators to important lows. The 4000 level is an obvious downside target, with 3800 as the next lower support zone. The LT wave for March correctly indicated the weakness for most of the month, but the expected rebound in the last week has been disappointing. That doesn’t bode well going forward. For April we see a positive start followed by another period of weakness with bottom values around April 10th and 19th. The final days of April look a bit stronger again. We are entering the first eclipse season of the year, so today I will share some research before we present our current interpretation of the market. Upcoming lunar and solar eclipses are known in advance and sometimes announced in the news. And on astrology related sites you will usually find forecasts about the impending disasters that are going to hit us as a result of the next eclipse. Indeed, eclipses have had a bad reputation for centuries. But it is also clear that we get a couple of eclipses every six months, usually in the form of a solar eclipse preceded or followed by a lunar eclipse. Obviously the world is not ending every six months. So, how do eclipses influence the stock market? If they evoke fear in a lot of people, then we would expect some effect. Well, I have looked into all eclipses going back to 1950, and how they have affected our lunar Red and Green periods in the stock market. Solar eclipses always come within a lunar Green period, because solar eclipses always come on a new moon day. Lunar eclipses always happen on a full moon in the lunar Red periods coming before or after a Green period with a solar eclipse. The result (based on over 130 eclipses in 60 years): solar eclipses have historically been very good for the stock market. Investing in the eclipse Green periods has yielded and annualized 17% gain, vs 11% annualized for all Green periods. That’s significantly better than average. Of course, that doesn’t mean the stock market never goes down in eclipse Green periods. About one eclipse green period out of six has generated a decline of more than 2%. But once out of four it has produced a gain of over 2%, and in 10% of the cases it produced a better than 4% gain. But that’s not the end of the story. I also looked in the Red periods that come before and after a solar eclipse. This are typically the periods that contain the lunar eclipses. These Red periods have a negative expectation, especially the red period that comes before a solar eclipse. It doesn’t really matter whether the period gets a lunar eclipse or not, these periods have averaged an annualized loss of 8.5%. Again, this doesn’t mean that every red period before a solar eclipse has been negative. In about 15% of the cases these periods have shown gains of over 2%. But in 33% of these periods there has been a loss of over 2%, and in 20% of the cases the loss was over 5%. 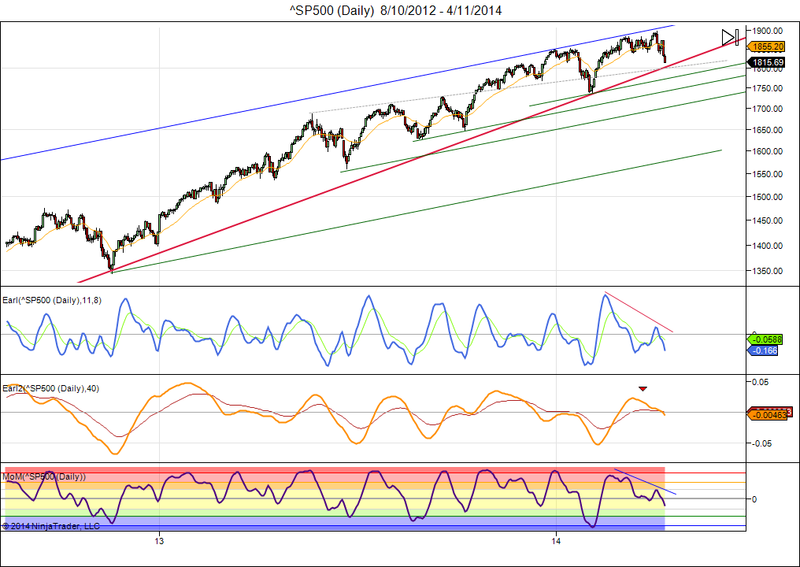 So, fairly often these red periods have produced significant downturns in the market. The red periods that come after a solar eclipse are less outstanding and have just a break-even expectation, they tend to go either way. Bottom line: historically the most profitable strategy going into eclipses has been: go short in the Red period before a solar eclipse, and then go long in the ensuing Green period that contains the solar eclipse. There will be a solar eclipse on May 10th. This means we are now starting the Red period that precedes this eclipse, the most dangerous type of Red period in the cycle. Given that the market has climbed to record highs, the setup for a sudden downturn is fully in place. The Nasdaq is trying to follow the S&P with a break out to the upside. But there are warning signs. The Earl2 remains negative for the moment, but could turn into a buy if the market continues to go up from here. In the shorter term Earl we see a bearish divergence shaping up. So, given the history of eclipse red periods, I have now sold almost all my stocks and bought some put options. One doesn’t need to be fully invested in the market at all times. These eclipse red periods are the best time to stay away from the market, and if a downturn materializes then you can jump back in to benefit from the positive Green period that often comes with the solar eclipse. Once in a while I get questions about lunar and solar eclipses, or messages from readers who protest against my website stating that eclipses are rather irrelevant for the markets. I can’t help it that there is no consistent effect from eclipses as such. It’s just a common sense thing. Any casual observer can find out that there are between 4 and 7 eclipses each and every year, so whenever there is a decline in stock markets, it is guaranteed that it will be no more than three months away from some eclipse, and about half of the time it will be less than a month away from an eclipse. But that doesn’t mean the market decline or panic has anything to do with the eclipse. It is equally easy to observe that the stock market goes through many years without any panics worth talking about. So, then it must be clear that the 4 to 7 eclipses in that year didn’t cause anything special. That being said, for somebody who wants to dig a bit deeper into eclipses, there are a few things worth considering. Lunar and solar eclipses are not standalone events. Eclipses are related to each other in what is called the “Saros cycle“. I am not going to use this article to explain the Saros cycle, wikipedia and other sources will do a better job than I can do on that point. All we need to know for our purposes here, is that very similar eclipses occur every 18 years, and they create long series of connected eclipses that can stretch over more than a thousand years. From the perspective of market panics, it can be found that certain Saros series have collected a bad reputation, so to speak. For example the famous Tulip mania came to an end in 1637, near a solar eclipse belonging to Solar Saros 125. Remember, there are about 40 active Saros cycles at any moment, and only a few of them have coincided with market crises on a somewhat regular basis. Within a given series the eclipses always come at 18 year intervals, and as we can see, even in the worst series not every eclipse came with meaningful trouble. That’s why, if you were to give an astrologer some stock market charts (with dates removed), he would not be able to tell where the eclipses have come. Bottom line: don’t get overly worried about upcoming eclipses. Most of them just come and go. It may be useful to keep an eye on the really “bad” Saros cycles we mentioned above. By the way, the upcoming lunar eclipse for May 25th is a rare eclipse marking the start of Lunar Saros 150. For most of us this will be last time we experience the start of a new Saros cycle, because the next opportunity to see the start of a lunar Saros cycle will come in June 2096.